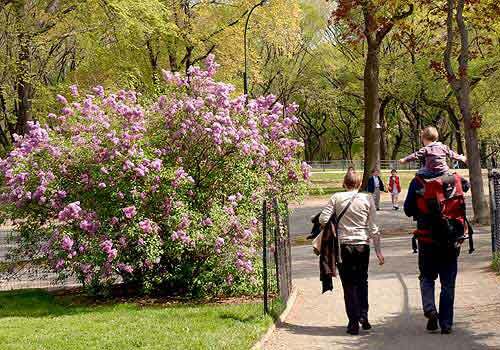 On the northern edge of Sheep Meadow, Lilac Walk boasts many varieties of its signature fragrant flower from around the world. Artfully composed, the walk was designed for the greatest visual effect. Come spring, it's a wonderland of white, pink, and purple blossoms. Twenty years later, Conservancy gardeners undertook the major task of replanting the beds. Today, the little path along the meadow is a spring highlight for Park lovers. Mid-Park at 69th Street just north of Sheep Meadow.